My initial searches for textile waste started with the network I had. I planned to connect to a few local contacts working in Textile Supply & Distribution, whose business is importing and exporting all kinds of textiles from various locations (including India, Turkey, Egypt & many others). My request was for any kind of textile, so to a great extent, this has influenced the kind of material I could create and structures I could make. I gained a lot of insight into what they consider waste and what would get discarded on a periodical basis. Most of the textile suppliers I contacted had swatches from past collections, which meant that the textiles would have been out of date for them to offer to clients and therefore they were due to be thrown away. It is this part of the supply chain I wanted to tap into. Old season textile hanger samples which were no longer in fashion or in production, were 90% of what I finally received. Amount of Textile waste collected & received: over 65msq… and still coming! The textiles came in batches over 5 months and I sourced form 4 different suppliers finally. With about a month to go on the final project I go to the stage where I had enough textiles to be able to make preparation to make some larger more experimental textiel composites that I had previously. The mix of textiles from each Textile supplier was staggering; from printed polyesters to jersey cotton t-shirt swatches with 3% of elastane, much of the textile waste was from fixed fibres. Despite the difficulties, my network proved very useful and even led to me gaining a new contact ( whom I’m still receiving textile waste from). I can say with certainty that once an idea is established, it can quickly gain traction and word spreads. I aim to continue building this network as I can see it would valuable not only to myself as a designer and textile teacher, but also in the community of education as well as benefiting the textile suppliers credentials. 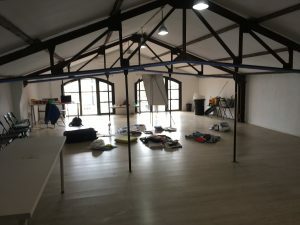 In the future it would be ideal to have a studio location and be a registered charity or organisation that receives textiles waste, which a clear strategy of it’s reuse purposes and system for organising.